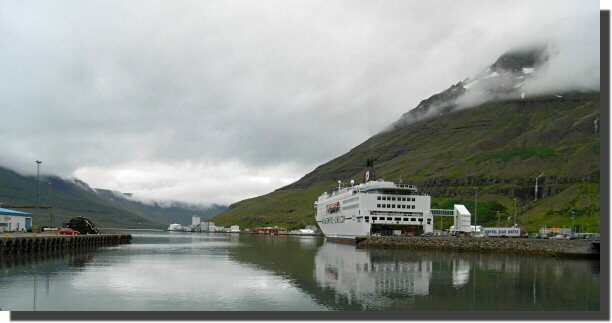 On Thursdays the town of Seyðisfjörður is dominated by the arrival of the Norröna. The town's normal population of about 700 is more than tripled for a few hours (say 800 passengers arriving and another 800 leaving). Disembarkation from the Norröna was very quick, with about 85% of the vehicles being waved thru customs and immigration without comment. The 15% of vehicles selected for checks (at random?) were sent to one of two channels. High technology and low technology. The high technology inspection appeared to involved "imaging" the entire vehicle. With the suspect vehicle stationary an expensive-looking customs "imaging" vehicle drove very slowly past the suspect vehicle. Exactly what technology was involved I don't know. The driver remained in the suspect vehicle during the scan. 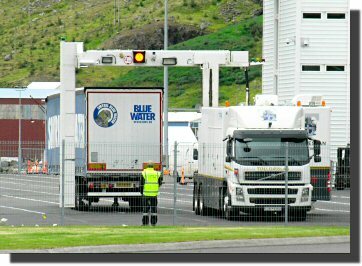 After all the passenger vehicles (cars and motorhomes) had been dealt with the "imaging" vehicle moved on to scan the truck trailer units (right). Note that the big inverted "U" frame is attached to the imaging vehicle (the Volvo truck). Seyðisfjörður has lots if nice buildings, a garage, an ATM, a camp site and a good but expensive restaurant. Although one has come to expect photography in churches, this was the first time I had seen a tourist plug in their notebook pc and send email from the pews. (No, not me).